For years, the parents of the Inner Sunset had cajoled, lobbied, and petitioned to get a new schoolhouse to replace the humble Laguna Honda School on 7th Avenue between Irving and Judah Streets. Finally, in 1905, the city added the school to a list of new educational buildings to be constructed across the city, and by the next spring, the new brick-clad Laguna Honda was well underway and predicted to be ready for the fall term. On April 18, 1906, the San Andreas Fault slipped. 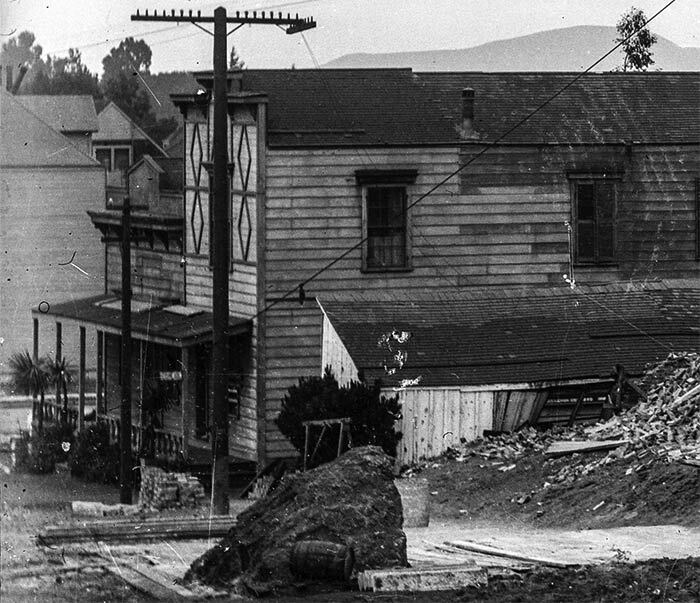 Earthquake Ruins of Laguna Honda School, 1906. The Milk Punch House roadhouse is on the left (wnp15.1265, courtesy of a private collector). In the photograph above, the school doesn’t look that badly damaged after the earthquake, but official deemed it beyond repair. The whole project went out to bid again, and the parents waited until 1909 to see a new building open—one that still stands today as Independence High School. Laguna Honda closed as an elementary school in the 1970s. While seeing the never-occupied Laguna Honda was a treat when we scanned this large glass plate negative, I personally was more excited to see the ramshackle two-story edifice with the small stable just to the north. This was the famed Milk Punch House, a roadhouse stopping point for travelers day-tripping to Laguna Honda lake or winding through the dunes and scrub of the Sunset District to Lake Merced.) Milk Punch was made with rum or whiskey, shaken to a froth with milk, and topped with nutmeg—think brandied eggnog without egg. The nearby hills around Mount Sutro were home to a few dairies, and no doubt the primary ingredient of Milk Punch (if not the most essential) could be easily obtained. Milk Punch House had seen better days by 1906. Laguna Honda School started in 1869, and had been a companionable neighbor with the roadhouse for many years before some people began to object to having a drinking establishment so close to children. New ideas of respectability had arisen after the 1894 Midwinter Fair brought more businesses, families, and church-goers to the area. While downright closing the Milk Punch House seemed outside their power, a few concerned citizens tried to cripple it by attacking its popular proprietor, Elizabeth Chadwick. Outside of her punch-concocting, Chadwick earned $20 per month as the “janitress” of Laguna Honda School. Mrs. Chadwick reportedly had “pull,” and said she couldn’t be fired. The response from some of the Board of Education members certainly bore her out. One joked that perhaps instead of closing the saloon, they should close the school. Another, obviously a patron, complimented Chadwick’s mixology. A third conjectured that people’s complaints were likely more about milk punch not agreeing with their constitutions. Eventually, the Board relented and Chadwick, pull or not, had to give up her side gig cleaning the school. A few months later, the Grand Jury discovered her replacement was none other than the Milk Puncher’s daughter. After another outcry on the immoral mixing of saloon and school, a non-Chadwickian custodian finally was found. More on Laguna Honda School and the Milk Punch House on the Outside Lands San Francisco podcast. Front view of Laguna Honda School on 7th Avenue, January 1934. (wnp14.4658, courtesy of a private collector). 1. “School or Saloon?” San Francisco Chronicle, May 23, 1895, pg. 7. 2. “Pull of a Janitress,” San Francisco Chronicle, May 30, 1895, pg. 8. 3. “The Milk Punch Janitress Goes,” San Francisco Chronicle, September 12, 1895, pg. 8.